Have you ever loved a song or poem so much that you wanted to be buried with it. The Song of the Harper was exactly that for ancient Egyptians. I have to admit, I was moved by it when I read the version that was written on Inerkhau’s tomb at Deir el-Medineh. When I read that passage (full text available here) I immediately wanted to incorporate it into an illustration with a contemporary twist. I decided to change up the subject first. I’m a fan of standing poses, so I chose one of the musicians from Amenemhat’s Tomb. I also wanted to incorporate the original hieroglyphs from the wall of Inherkhau’s tomb as seen below. Unfortunately the song lyrics in the photo (on the left) are incomplete. 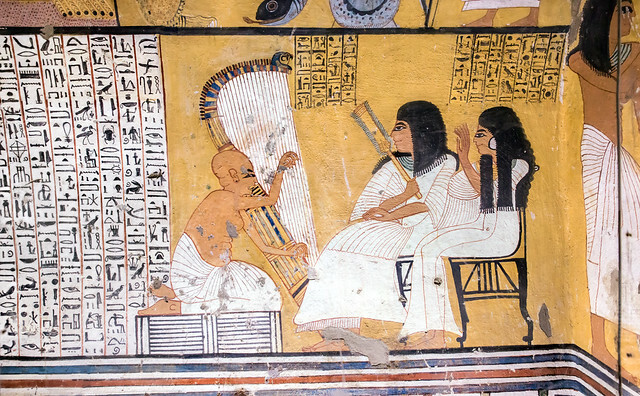 The site OsirisNet.net (thanks to everyone listed here) has a very detailed description of the tomb along with panorama photos of the inside of the tomb. The site also provides a transcribed copy of the text from Bernard Bruyere the French Egyptologist who published the first excavation of the site in 1927. Now that I had the original text and English translation, I could begin work on finding the text corresponding to the English version above. Full disclosure here, my wife is a trained Egyptologist, so I was able to get her help in isolating the correct text. Once I had the text, it was a simple matter of layout. 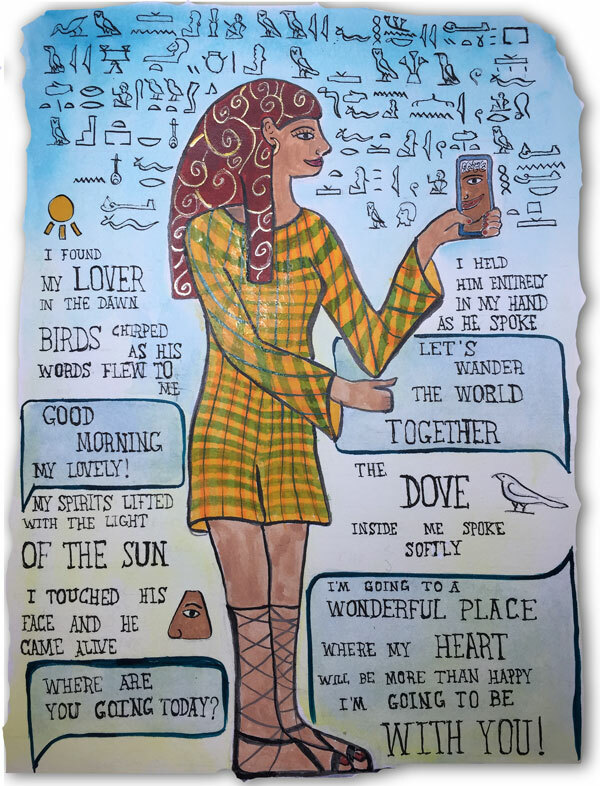 I chose to place the hieroglyphs on the outside columns of the illustration and then add my own “remix” of the text (just as I did the musician) around him.